Ruby House dancing Queen and now notorious rabble-rouser, Selly, was on the receiving end of a severe talking to by Big Brother this evening. In case you missed it, the Ghanaian stunned her fellow Housemates and viewers alike during the Channel O party on Saturday night, when she dumped a glass full of alcohol over Pokello's head with absolutely no provocation that would warrant such. This evening, Big Brother called all the Rubies, who have talked about the incident in hushed tones since it happened, to the lounge to hand out his punishment. Deafening silence descended over the House as full, uncut footage of the incident was beamed into the House. The culprit, Selly, looked on in what looked to be sheer agony and embarrassment as she was exposed for all to see. When asked to explain herself in the Diary Room, a panic-stricken Selly told Big Brother she delivered her golden booze shower because Pokello is a good dancer. "I poured alcohol over Pokello's head to show her that she was really dancing well. I didn't do it to provoke her because we get along. I realised later that she didn't find it amusing. We have spoken about it and I have apologised”, she said. Selly went on to reveal how she does the same in Ghana when her friends excel on the dance floor. When Selly emerged from the Diary Room to apologise once again, Pokello told her "It's okay. Don't worry about it". Take a look at the footage below and share your thoughts. Was Selly giving props or was she trying to stir up trouble? 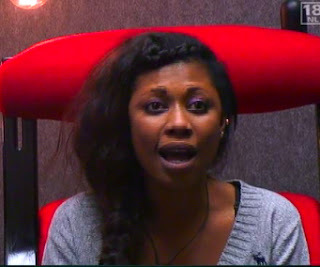 Big Brother has introduced a Strike Wall that will serve as a reminder that Housemates are not a law unto themselves. This particular incident happens to be Selly's first strike and should she receive three more strikes, she will be expelled from the game. Biggie ur wicked! Wat a headline???? How I wish is true. My dear, selly did what she did porposlly. If u r pouring a drink on someone bcos she knows how 2 dance u Ave 2 tell d person not every body knws dis.even after selly pour d drink her she did not even go close 2 tell her dat she can dance. Who told u we do it a lot in Naija. @Kay, who told u we do it a lot in Naija, dat is now u guys go abt giving wrong impression about Naija. whether u admit it or not, we actually do it a lot in Naija, but its not a bad thing here, not meant to insult or embarrass , it is just for the exact reasons Selly gave. Anonymous 3.12am, what offence has Biggie committed? Pokello said that she had forgiven her.You should learn how to be objective in your judement.You shd also have an African spirit of one love and be your brother/sister keeper. Students do dis on someone's last exam as a student in the school. Ur friends will be waiting 4 u @ the door of ur exam venue 2 pour drinks/water on ur head. So, nothing wrong wit wat Selly did. She did it out of sheer happiness dat Pokello can dance very well. Biggie abeg spare her 4 us oooooo.